The importance of HIPAA compliance is being recognized by many authorities as the online services for healthcare becoming more common each day. Here is a quick guide for you to better understand what HIPAA compliance is if you are not that familiar with the concept. As medical professionals started to keep their patients’ medical data online, they must have clear protocols of keeping that data safe according to HIPAA compliance. 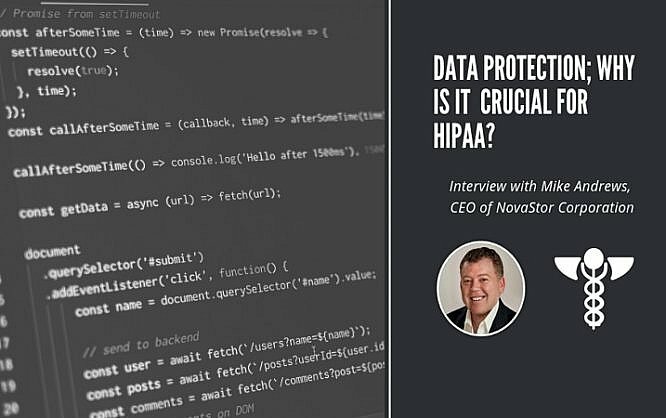 Mike Andrews, CEO of NovaStor Corporation knows the importance of HIPAA compliance and data protection more than most as he is a 25 year veteran in the data security industry. In our interview, Andrews provides his thoughts on the importance of HIPAA Compliance and data protection in general. What drew you to the data protection service? Making quality data protection affordable. NovaStor has been developing data protection services for well over a decade. Backup/data protection software/service is all we do, it is our DNA. What continues to drive us is that there is a growing need for data protection based on industry regulations and compliancy requirements. Data increases at exponential rates, yet technology budgets and qualified IT staffing budgets are on a much slower, sometimes declining pace. NovaStor focuses on removing the burden and helping these overwhelmed and underfunded businesses meet their tough compliancy requirements. Each NovaStor support person has several years of experience as an IT administrator and most have several in the field of data backup protection as well. Most IT admins need to be a jack of all trades and backup is a small (but important) part of their responsibility. If backup becomes a large part of their job, it usually means problems. NovaStor helps enable by putting preventative measures in place so that backups just work and they can focus on their other tasks. Why are data saving and protection important in HIPAA? It’s important because any breach of Patient/Protected Health Information (PHI) is against the law and subject to severe penalty. Being HIPAA compliant also allows you “peace of mind” knowing that, your practice meets the requirements that ensure confidentiality, integrity, and availability of all Patient Health Information. Having a backup and recovery plan provides high levels of security and immediate accessibility to patient data, which are the main components of being compliant with HIPAA. Also with HIPAA, even if you have a plan and there’s a breach, having such a plan in place protects you from a penalty as it demonstrates you took precautions and had proper intentions. The answer so far explains why data saving and protection are important in HIPAA, but what is even more important with establishing a backup and recovery plan is your own business continuity. You’re in business to keep your doors open and make a profit through customer satisfaction. Preparing for HIPAA prepares you for a better opportunity at success. More than just complying with legislation, having a Backup and Disaster Recovery Plan and testing it frequently can avoid revenue losses and damages to your company’s image. What are the benefits of having a HIPAA compliance? The top benefit of HIPAA compliance is that having taken the proper precautions to protect your patients’ information, you are protected from penalties associated with being non-compliant. Reputation is critical in any service field and by being HIPAA compliant, you have agreed to set higher standards of data protection for your company. Compliance also ensures that you are prepared for disasters, system failure or cyber-attacks. As headlines show daily, data loss is growing exponentially and companies are suffering from post-incident losses to the point of going out of business. While being HIPAA compliant may seem time-consuming, a little prevention can save you a lot of trouble in the future. This is comparable to installing a fire alarm over dealing with the aftermath of a fire. How often should we backup our data? While every environment is different, we recommend starting out with these 3 standard backups and making adjustments: a System Image Backup once a month, a Full File Backup every week and a Differential File Backup every day. A friendly reminder is that a backup is only as good as your ability to restore from it. So do test restores of your backups frequently. It is also important to make certain that your plan includes having a backup of your data offsite. The question you need to answer is “How far back can I afford to lose data without affecting my business?”. You want to make certain that this is the minimum requirement of your plan. What is the importance of patients’ data protection? The data in the electronic medical records contain patient’s names, addresses, phone numbers, places of work, IDs, card numbers, historical medical information, medical and social insurance. With that, hackers’ interest in this type of information has increased sharply in recent years. Cybercriminals have found many ways of making money with stolen medical information. However, material losses are not the only harm that this type of cyber attack can inflict. Stealing patient information can endanger the health and lives of people. One simple example: an unconscious patient arrives at the emergency room and needs immediate treatment, but the doctors don’t have their allergies on record. Following HIPAA guidelines strictly can safeguard patients’ information and prevent severe consequences. What are the penalties of HIPAA breaches and how to prevent them? The HIPAA violation penalty tiers vary according to the level of perceived negligence found within your organization at the time of the HIPAA violation. Medical institutions can face a fine up to $50,000 as well as imprisonment up to 1 year for disclosing individually identifiable health information. If there was a proven intent to sell, transfer or use individually identifiable health information for commercial advantage, personal gain or malicious harm, institutions can face fines of $250,000 and imprisonment up to 10 years. Some companies pay millions in settlement costs for having failed to adhere to this federal law. You can prevent these penalties by working continually to train and inform employees about HIPAA in addition to constantly ensuring that your organization complies with each HIPAA guideline and have documented plans in place. How many categories of backups are on your website and what is the most secure one? All NovaStor backups, when implemented properly are secure. Each solution protects data (PHI) at the source, the destination and even during transmission. High levels of encryption are employed that make even compromised data unreadable. NovaStor has solutions for every backup category and supports every local or offsite (cloud) based storage device. The best or most secure solution depends on your environment. NovaStor technical backup experts help each customer determine the best solution for their environment. NovaBACKUP, our backup solution for small business owners, offers backup and restore for Windows Systems on both PC and Server and also supports virtual environments (Hyper-v, VMware) as well as Microsoft SQL and Exchange. We also have a large scale-enterprise data protection solution called DataCenter, available for those with multiple server networks or a large amount of data. All solutions provide the same high level of security to users, with outstanding support by industry experts and competitive pricing. NovaStor constantly feeds their customers with news, educational articles and tips about data protection. By having a strong and reliable backup solution in place combined with a backup and disaster recovery (BDR) plan, you can concentrate on your business while knowing that your data is completely secured. Health professionals can easily tell that having HIPAA compliant solutions to store their sensitive data is vital. Especially nowadays there are more medical professionals who are taking appointments and get their patients’ data beforehand on their personal website. In this case JotForm’s online forms are perfect since they can also be HIPAA compliant. Feel free to share your thoughts and questions in the comments area below! You are here: Home / Data Protection; why is it crucial for HIPAA?